With the new PocketBook 616 the reading “on the go” breaks the new ground. Implemented in the new minimalistic and refined design, the compact device with dimensions of only 161.3 × 108 × 8 mm suits standard jeans pocket and even the tiniest ladies purse. 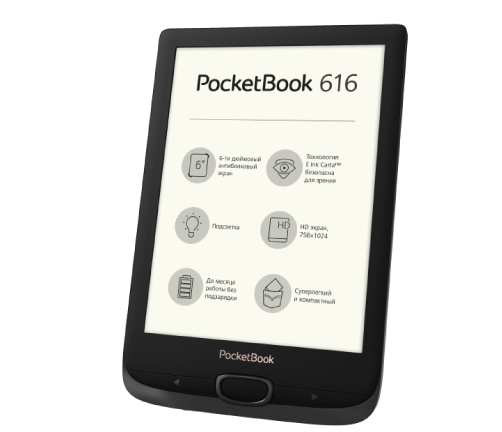 PocketBook 616 is equipped with E Ink Carta™ screen with HD resolution (758 × 1024), which ensures safety and comfort for the eye even after hours of non-stop reading. The LED frontlight invites to enjoy the fascinating e-book even in a space with low-light conditions. The built-in Wi-Fi with PocketBook Cloud, Dropbox PocketBook and Send-to-PocketBook services give convenient opportunity to deliver any e-content to the device without having connection with PC. The reader supports without conversion 17 book and 4 graphic formats, such as JPEG, BMP, PNG, TIFF. The preinstalled dictionaries offer two language combinations to read books in foreign languages. With the cover sensor the e-reader allows using “sleep function” and save the battery charge with one of brand PocketBook accessories compatible with this particular model. The new PocketBook 616 embodies the lightness and simplicity in all senses. It received ergonomic paging buttons for facilely controlling. The weight of only 155 grams makes the e-reader one of the lightest on the market. With the intuitive user interface the changing of settings and managing the library is easy and fast. The e-reader may be always at hand, offering to choose one of up to 3000 e-books from the personal user’s library. 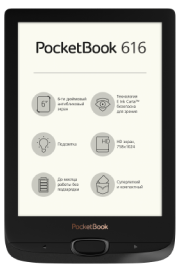 PocketBook 616 has 8 GB of internal memory and a slot for microSD cards, which allows expanding memory up to 32 GB. Batareya (aktiv oxuma) 1300 mAh (Li-Ion Polymer). Up to one month of battery life (may vary depending on usage mode, connectivity and settings). Fləş yaddaş 8 GB. The actual available internal storage size may vary depending on the software configuration of your device.